I know it's only October, but would you stone me if I started showing some Christmas projects I've been working on? I was going to wait until December to "respect the Turkey" and all that, but that would probably mean blog silence for the month of November! Last night I began to work on some Christmas ornaments. I had a sheet of music note scrapbook paper that I have wanted to use in a project forever. Since this year I want my projects to be quick and easy and made with materials I have on hand, I thought this would be a perfect time to put it to use! 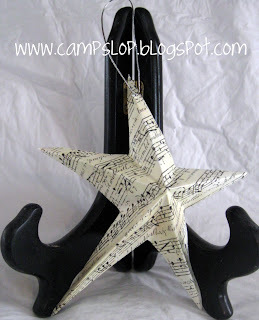 First, using a template from Better Homes and Garden, I made this adorable star ornament. This project was so fast I finished it in the time it took my kids to get their pajamas on - no joke! Later I applied a coat of ModPodge to it to make it a bit sturdier. Still using the same sheet of paper and this tutorial from Living the Swell Life, I made this too cute for words bird ornament. 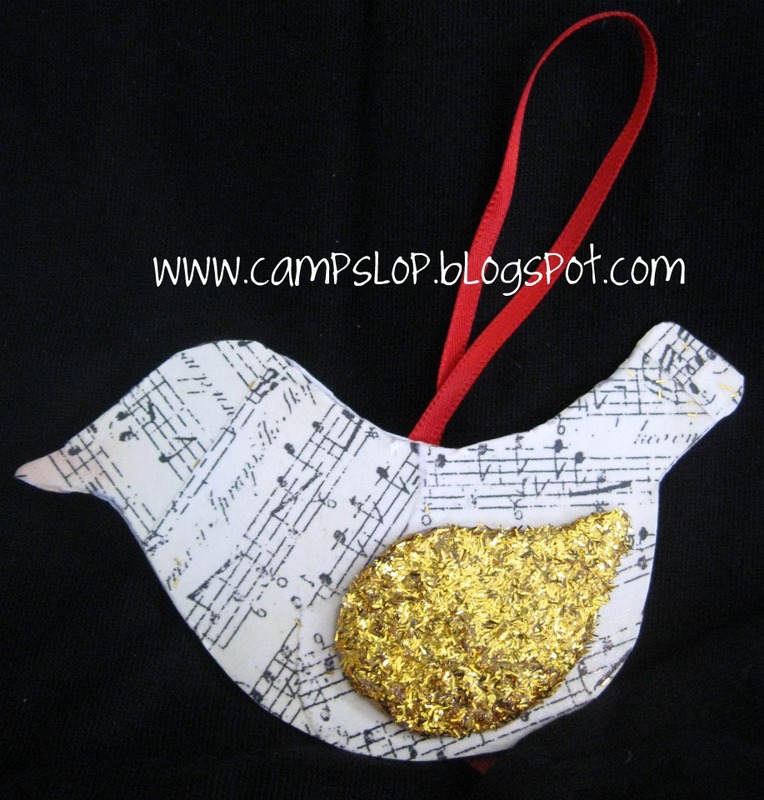 I love this ornament so much I may make more to give out as gifts. The tutorial calls for chipboard, but I used some thinner cardboard from the recycling bin. It worked perfectly! To keep the glitter from flaking off I sealed it with a thin layer of Diamond Glaze. I still need to attach the ribbon for hanging it, so please excuse the haphazard ribbon placement on this one. Finally, I found a tutorial from Under The Table and Dreaming and made this cute paper accordion ornament. 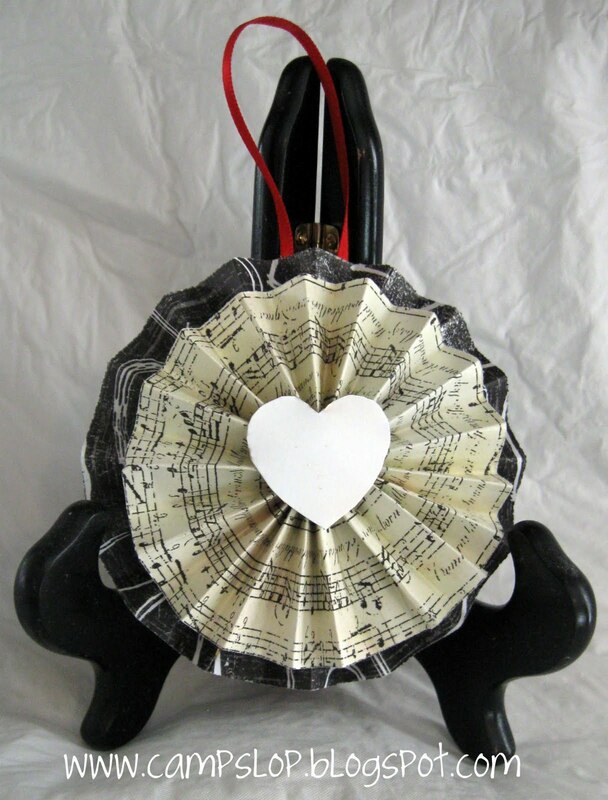 I used a small piece of scrapbooking metal to make the heart in the center. I really like how it turned out! It was a bit tricky to glue the two accordion pieces together, but I found that a little weight (from my glue bottle) helped hold it in place until it was dry. There you have it - three ornaments made from ONE sheet of scrapbook paper. I can't wait to hang them on my tree. Do you have any ornaments you plan to make this year? I'd love to see some more handmade holiday decorations!